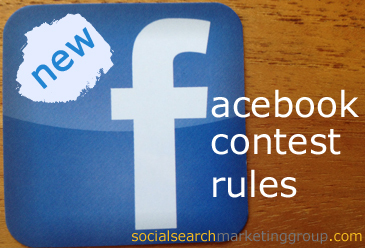 New Facebook contest rules make it easier for a small business to run a promotion! Facebook Contest Rules have changed this week. What used to be called as “illegal” contests on Facebook are now legal. These changes are a huge plus for small businesses on tight budget and who just wanted to run a quick contest. “We’ve removed the requirement that promotions on Facebook only be administered through apps. That is great right? Well….yes and no. The upside to this is that any small business on tight budget can now run a contest on Facebook. Yep , you can do this free from the fear of finding Facebook breathing on your neck and potentially suspending your business page for not being compliant. The downside is that the Facebook contest CAN backfire. Facebook contest rules have changed but if running one plan it well and include in the plan a way to encourage engagement. Yes, it does have a dreaded downside if the contest is done without a plan in place. Your Facebook business fans could get annoyed seeing posts that are useless for them streaming in their news feed. Remember that social media is about “them” not you and your business. What your business “fans” can potentially do when that happens are: hide the post from your business page; or, worse, un-like your page. Gasp! Do you know how bad it is for your business page? Is it still called that? I digress. That is where you will get dinged, ,i.e, annoyed fans unliking your page. If those people are your forever loyal fans, I don’t think you have to worry about this. If not, proceed carefully with your social savvy hat on if you are running a contest on Facebook. 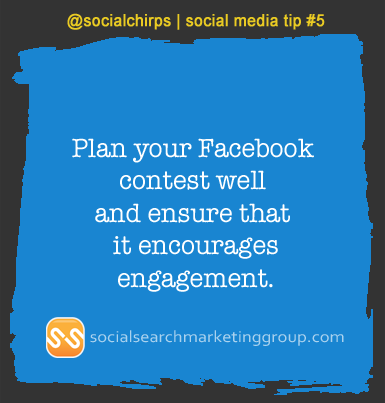 Plan your Facebook contest well and ensure that it encourages engagement. Also plan on keeping the momentum once the contest is over. Remember the note above that Facebook takes into account the people who “un-liked” your page. Keep your Facebook fans page entertained, errr engaged, to keep them “liking” your page. To know more about the complete Facebook contest rules, visit the Facebook for Business page. With Facebook contest rules eased up, are you planning on doing one real soon?